NOSFERATU is a silent, German expressionist film made in the early 1920s. It was directed by F.W. Murnau with cinematography by Fritz Arno Wagner and Günther Krampf, starring Max Schreck as Count Orlok and Gustav von Wangenheim as Thomas Hutter. It is based on Bram Stoker’s book Dracula, although the names and a few other details were changed because the studio was unable to obtain the rights to the novel. The story involves Thomas Hutter’s (Jonathan Harker) encounter with a “nosferatu” (vampire) named Count Orlok (Dracula) whom he meets at the Count’s castle in Transylvania. He is sent to the castle to negotiate the Count’s purchase of a house in Wisborg, were Hutter lives. Nosferatu is a gothic horror film that would influence later Dracula productions, and the actual legend of vampires as well (it introduced the idea that vampires fear and can be destroyed by the Sun). It is considered by some to be the greatest adaptation of Dracula. The photography in Nosferatu is highly influenced by the German Expressionist Movement and is very symbolic and stylized. This is what makes it one of the creepiest of the genre. The photography, for the most part, enhances the story. For instance, almost the entire film is shot in low key which adds to the eerie mood Murnau is trying to convey. Low key is used except for the few pleasant scenes like the pretty German countryside seen before entering Orlok’s castle — which is used for a contrast to the ominous building. Many shots are also in high contrast. Count Orlok is often shot in high contrast which emphasizes his pale hideous face and long, claw-like hands against the shadows and his dark clothing. This might also be used to symbolize the relationship of light and dark. Another thing I noticed was that Murnau barely uses any camera movement in the entire film; in fact the shots are rather simple, with most being full shots. There are some long shots and establishing shots that give the setting, but few close-ups. He does use a some point of view shots when characters are looking out of windows. However he uses a low-angle shot on the ship where we see Orlok waking on the mast, and some great close-ups of the Count in his coffin — and those terrible rats coming out of every little hole. When the townspeople are chasing Hutter’s employer (who is under the control of Orlok) he uses a high-angle shot that shows the entire street full of angry people between the houses. There are also some surprisingly good special effects. Stop-motion animation is used in the carriage ride and other scenes to represent some sort of demonic speed, a pretty “creepy” effect. In that same scene he inverts the negative (switching the darks and lights) which adds to the other-worldly feeling of Orlok’s land. He also uses superimposition to create a ghost-like image of Orlok a couple of times, as when he is destroyed by the Sun and turns into mist and smoke. All of these effects and shots enhance the film, but the shots that stand out most to me are the silhouetted ones of Count Orlok preying upon his victims in the night. The shadow of the twisted, stiff, and distorted figure of Orlok with those long, skeleton-like claws is a really powerful image. You see the outline of his hands climb up and wrap around his victim like a spiders’ web. 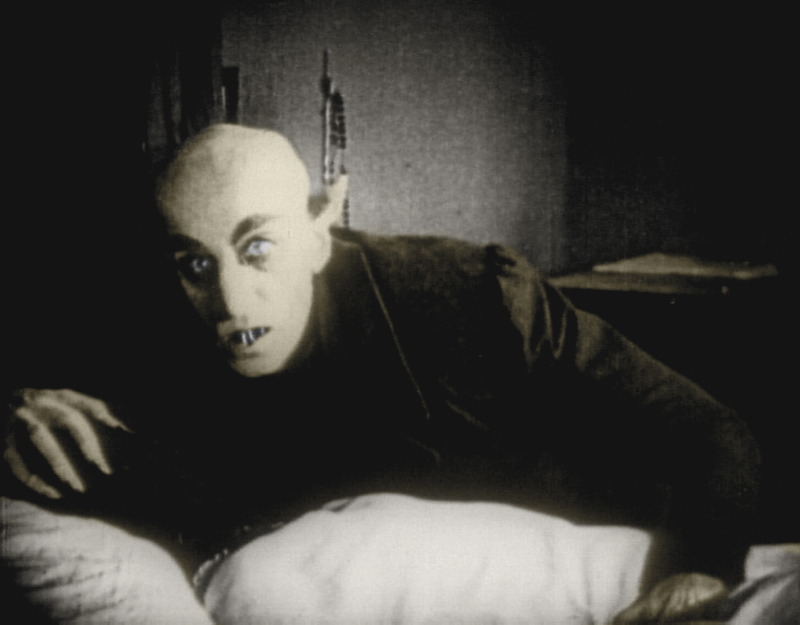 This iconic image is what I always remember about this film, along with the general image of Orlok/Dracula which is different than the modern-day interpretation. The only thing that was a bit confusing was telling what time of day it was — as even the night scene were rather bright. In conclusion, I would say that the photography is what makes Nosferatu a great movie. Since it is silent, the cinematography plays a much bigger role in setting the mood and invoking emotions than it does in talking films. Murnau, Wagner, and Krampf did a good job bringing this story to life. Using photography, good settings, and skilled actors they created a believable world and a most menacing monster. This uniquely Expressionist and symbolic film will not only remain a classic of its genre but also a major achievement of F.W. Murnau, a great director, and a disturbing film too — as it was intended to be.